The house was built in the 50’s with large terrace surrounding it, with tables and chairs where you can take breakfast or meals. It also has a hall and an inside corridor.2 bedrooms with private bathroom (hot water), are provided with windows. It is located facing the sea. At the rear part of the house you have a marvelous view of the mountains. 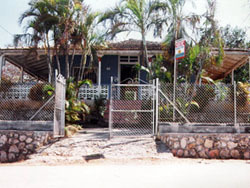 The house is 4 Km away from Trinidad and 8 Km from Playa Ancon (Ancon beach).